Short-rows, in essence, are partial rows of knitting. 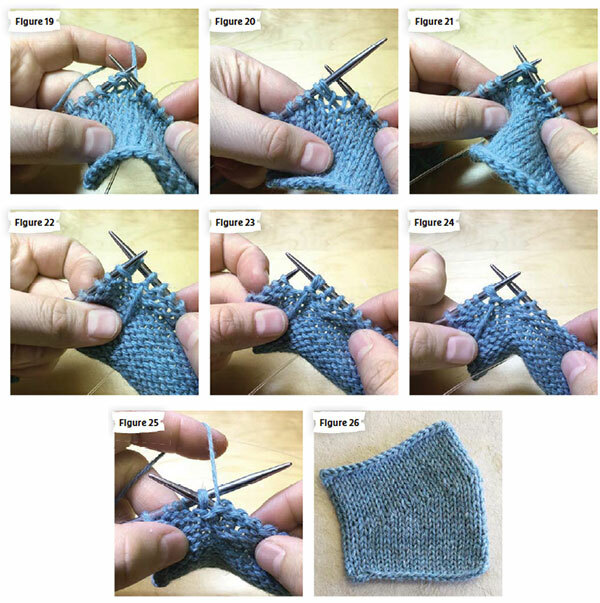 You can use short-rows to add height in places where you need or want it and to turn corners and create curves in your knitting (which is a predominantly linear and angular art form). We all created them accidentally in our first days of knitting, when we forgot which direction we were going and went back the way we had come without completing the row. Now, as then, a spot appears where the extra height causes a gap between the twice-worked stitches and the unworked stitches. In this article, I describe a few techniques for closing that gap to create the best visual presentation. German short-rows are a new variation on short-rows, one that has become popular in recent years. 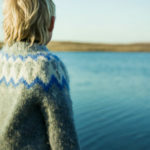 Through an ingenious manipulation of the fabric, both a slipped stitch and a lifted stitch are created at the same time. Therefore, German short-rows create about as little looseness as shadow wraps, and they result in seamless-looking, smooth fabric. 1. 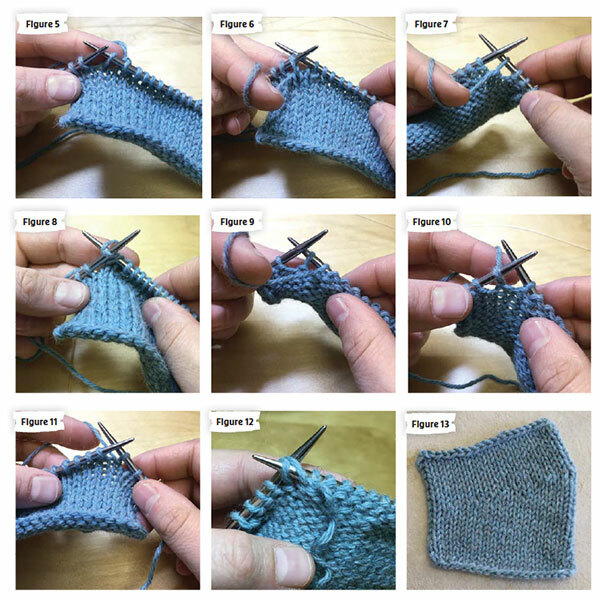 Knit or Purl row: At the end of the partial row, turn the work. Slip one purlwise from the left needle to the right needle (Figure 1). Bring the working yarn up and over the top of the right needle and gently tug. Doing so will distort the slipped stitch, shortening the loop of the stitch itself and wrapping the two parts of the stitch over the top of the needle, making it look as though there are two stitches sitting very close to each other on the needle (Figure 2). When you encounter this double stitch on a subsequent row, work the two legs of the stitch together as if they were one stitch (Figure 3). Figure 4 shows a finished swatch. Probably the most common short-row technique is wrapping and turning. It involves wrapping a loop of working yarn around the stitch adjacent to the partial row. When you come back to that stitch later, the wrap is worked together with the wrapped stitch so that the wrap sits on the wrong side of the work. Because wraps add some extra yarn to the fabric, they can create loose spots in your knitting. I reserve wrap-and-turn for projects such as knitted lace that have open fabric in which the extra looseness won’t be noticeable. 1. Knit row: At the end of a partial row, slip the next stitch purlwise with the yarn in back (Figure 5). Bring the yarn to the front between the needles and return the stitch to the left needle (Figure 6). Turn the work and orient the yarn as needed for the next row (to the back of the work for a knit row, to the front for a purl row) (Figure 7). When you encounter the wrap on a subsequent knit row, insert the right hand needle into the wrap, then into the knit stitch, and knit them together (Figure 8). 2. Purl row: With the yarn in front, slip the next stitch purlwise (Figure 9). Bring the yarn to the back between the needles and return the stitch to the left needle (Figure 10). Turn the work and orient the yarn as needed for the next row (Figure 11). 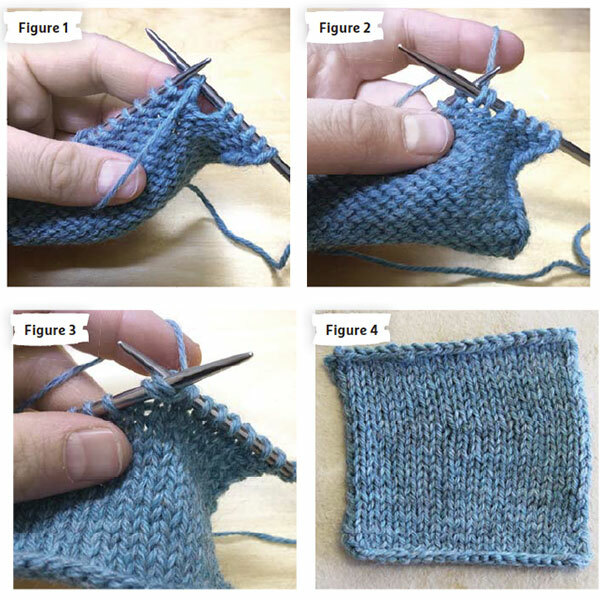 When you encounter the wrap on a subsequent purl row, pick up the wrap and place it on the left needle, and purl the stitch and the wrap together (Figure 12). Figure 13 shows a finished swatch. Japanese short-rows are my favorite short-row variation because they can be used on a plain fabric without adding any looseness. They involve both lifting and slipping: instead of creating a loop of yarn, you place a locking stitch marker on the working yarn at the turning edge of the partial row, then use that stitch marker to pull a loop out of the working fabric when you’re ready to complete the short-row. You also slip the first stitch at the beginning of the next partial row, which snugs up any looseness there. Because Japanese short-rows pull yarn from within the fabric itself, you don’t loosen your fabric. 1. Knit or Purl row: Place the stitch marker around the working yarn at the end of the partial row (Figure 14). Turn the work, slip one purlwise, then work the next stitch, making sure the stitch marker is between the slipped stitch and the stitch just worked (Figure 15). When you encounter the stitch marker on a subsequent row, pull the stitch marker and place the resulting loop of yarn on the left needle (Figure 16). Remove the stitch marker and work the stitch and the loop together (Figure 17). Figure 18 shows a finished swatch. Similar techniques: Sunday short-rows, unslipped Japanese short-rows. 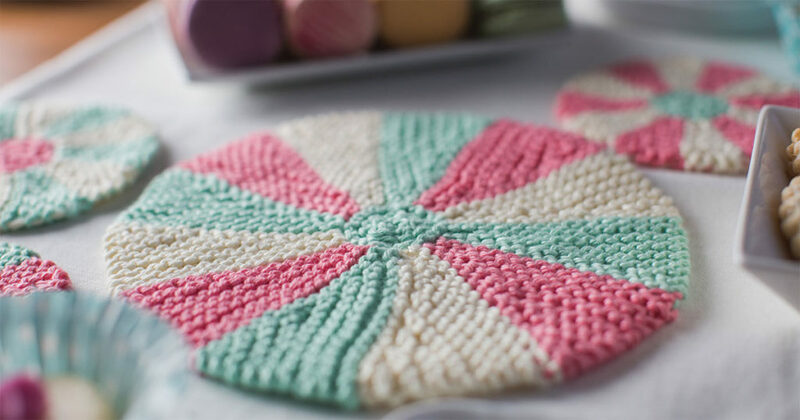 The former uses pieces of scrap yarn instead of stitch markers to help pull the loops onto the needle; the latter doesn’t slip the first stitch after turning. Shadow wraps are, in my opinion, the least visible short-rows from the front. They’re created differently from other short-rows. Although there is lifting, it occurs within the structure of a stitch that has already been created. This approach limits the looseness shadow wraps add to the fabric. Even though you add about a stitch’s worth of yarn, it is locked into place by how the wrap is created. Therefore, no looseness spills into the fabric around it. 1. Knit row: At the end of a partial row, insert the tip of the right needle from back to front into the top of the stitch in the row below the next stitch on the left needle. Place the stitch on the left needle and knit into it (Figure 19). Transfer the stitch from the right needle to the left needle without twisting it. You now have two stitches sprouting from a single stitch (Figure 20). Turn the work and complete the next row. 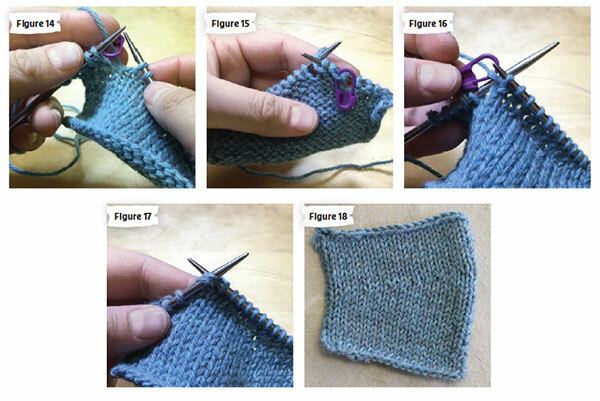 When you encounter the double stitch on a subsequent knit row, knit the two parts of the stitch together (Figure 21). 2. Purl row: At the end of a partial row, slip the next stitch purlwise to the right needle, then insert the tip of the left needle up through the purl bump in the row below the slipped stitch (Figure 22) and purl it (Figure 23). Transfer the double stitch to the left needle (Figure 24). Turn the work and complete the next row. When you encounter the double stitch on a subsequent purl row, purl the two parts of the stitch together (Figure 25). Figure 26 shows a finished swatch. These four short-row techniques are just a few of those available. Be sure to experiment to see which technique works for the kind of fabric you like to produce. I hope this tutorial will help you find the perfect technique for you! BRISTOL IVY is a knitting designer and teacher from Portland, Maine. Her work focuses on the intersection of classic tailoring and innovative technique. Visit Bristol’s website to find out more about her and her work. Learn all there is to know about short-rows!